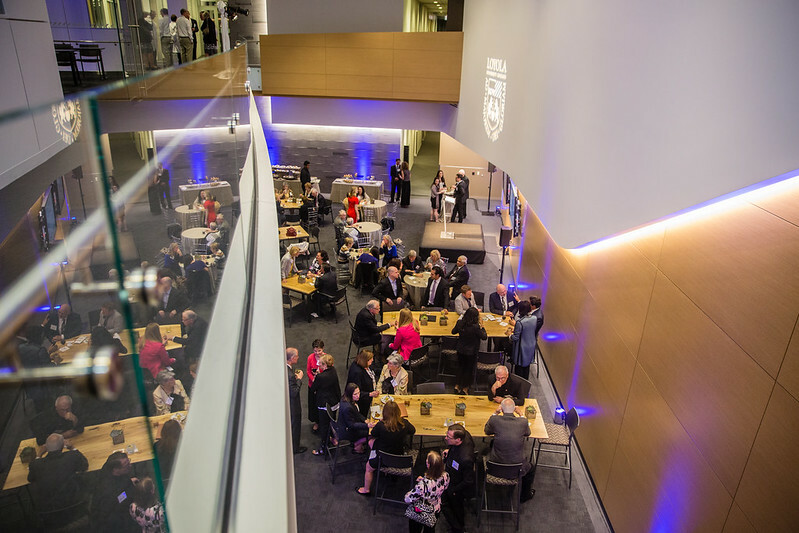 The 225,000-square-foot building is the biggest and most complex building in University history, and more than 200 people were on hand to celebrate the start of many translational research discoveries. Pelissero was joined by Margaret Faut Callahan, CRNA, PhD, FNAP, FAAN, provost of the Health Sciences Division, and several other University, Loyola University Health System, and Trinity Health leaders for a ceremonial ribbon cutting on the stage of the auditorium. Father Michael J. Garanzini, S.J., chancellor of Loyola University Chicago, led those present in a prayer and blessing. Richard Pazdur (MD ’79), director of the Office of Oncology Drug Products for the Food and Drug Administration, gave remarks on how far translational research, particularly in the world of oncology treatment, has come since he started his medical career. “Loyola has a special place in my heart and I have watched the progress of the medical center here in Maywood over the last four decades with a great deal of pride and admiration for the work of the faculty in terms of excellence in patient care, research, and education,” Dr. Pazdur said. Guests were given tours of the various labs in the CTRE, by researchers who study everything from heart failure to obesity in underserved populations to innovative new cancer drugs. Each floor has study space for students along with a mix of wet labs (where typical test tube and microscope research is done) and dry labs (where more statistical and computational-based research is conducted). The second and fourth floors have open atriums that invite collaboration between labs and scientists. The CTRE houses more than 500 faculty, staff, and students from the Stritch School of Medicine, The Graduate School, Marcella Niehoff School of Nursing, and Loyola University Health Systems.